1. Gabinova’s wire mesh panel gabions are produced from premium Galfan welded mesh from Germany, with a zinc coating out of 95% zinc and 5% aluminium. The panel diameter is 4mm and mesh size is 50x50mm. 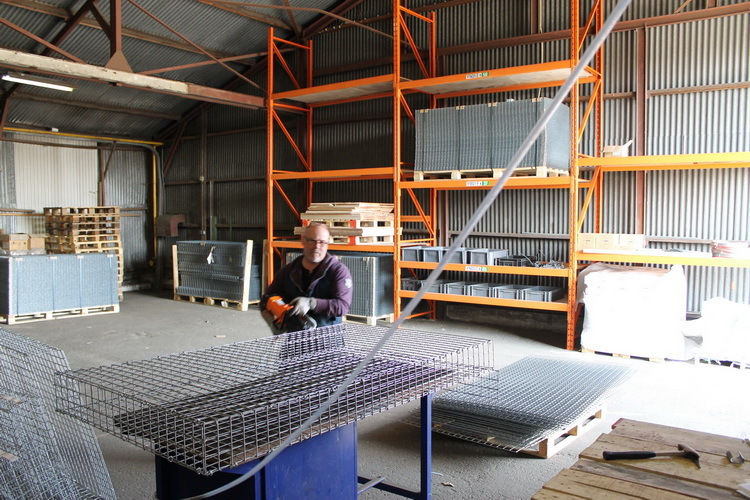 By default, Gabinova delivers various clamps and/or a partition along with the gabions. 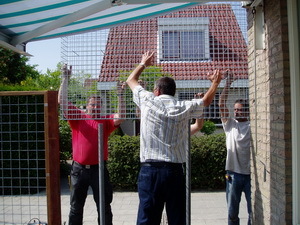 In this way, “expanding” of the gabions is prevented and a straight gabion is guaranteed. 2. Gabions that are filled up with rubble stones require wire panels with a mesh size of 75x75mm. As a result of the bigger mesh size, these panels have a larger diameter width of 4.5mm. 3. 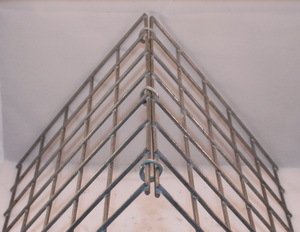 The wire panels have a zinc coating of 350grams/m2. This ensures a life expectancy of approximately 75 years. 4. 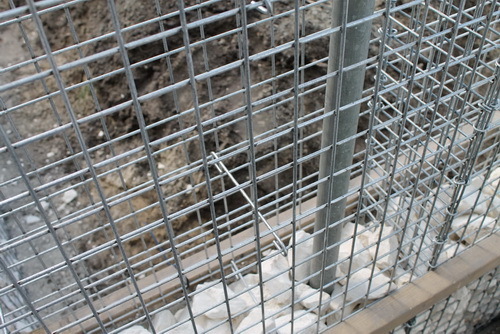 With regard to the production of gabions, we are using of wire mesh panels that measure 2x1m. Long sections of gabions will be divided into maximum dimensions. A clean end result will be guaranteed. 6. It is advisable to place the gabions on a straight and stable surface. We recommend a foundation of broken rubble, concrete tiles, and preferrably a foundation strip of concrete. As a result of the weight of the rubble stones, a proper foundation is essential. A default gabion of 2m x 1m x 30cm (hxwxd) contains approximately 1000 kilos of stones. This kind of weight asks for the right surface. When using higher and narrower gabions, you can make use of scaffolding pipes to stabilise the gabions. 7. Gabinova delivers empty gabions, which provides for a very simple installation. After installing the gabions at the desirable location, you can fill them up with rubble stones. 8. It is recommended to fill the larger rubble stones by hand. During the filling process, you should place the flat side of the stones facing outside, after which you continue filling up the inside part. By doing so, you will create a beautiful and tight end result. If you ordered smaller rubble stones, you can easily pour the stones in the gabion by using buckets. 9. After the gabions have been filled up, you will end up with some residue. You should remove these yourself. You cannot prevent ending up with this residue; the rubble stones always contain a percentage of delicate material coming fourth from different grooves. 10. All pallets and Big Bags are intended for single use only, so these will not be returned to Gabinova (no deposit). 11. With regards to the delivery of the gabions, the delivery period is approximately 2 weeks. Before the delivery, you will be contacted by phone to inform you about the exact delivery date and time. 12. For the delivery of the gabions, including the rubble stones, we will make use of a curtain sided trailer with kooiaap (smaller forklift truck). We have different pipe sizes (1m, 2m, and 3m) in stock. are manufactured by 4mm Galfan zinc steel wire. longer than regular galvanised material. end result than meshwork with a size of 10 or 15cm. 4.5mm. You can fill up these gabions with bigger rubble stones. every 15cm. In this way, we can manufacture robust and sustainable gabions. so called spirals because these may disorganise the tight proportions of the gabions. with rubble stones, the scaffolding tubes will no longer be visible.